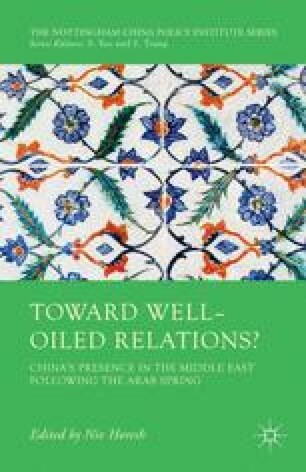 With few exceptions, all recent analyses and commentaries that link the US and China to the Middle East share similar conclusions, pointing to two main inter-related phenomena reflecting one fundamental assumption: that the US and China are engaged in a competition (or even rivalry) in the Middle East. Many seem to believe that the US is losing ground in the region because of its crippled commitment to its allies, its policy of “rebalancing” or “pivoting” to the Asia-Pacific region, and its expected withdrawal from Iraq and Afghanistan. Also, the US has allegedly become more self-reliant in terms of oil production and no longer needs Middle Eastern oil. Consequently, the conventional wisdom argues that the US is planning to gradually divest itself from the region. According to these views, Beijing will fill the vacuum created by the US withdrawal; indeed, it already seems to be ramping up its presence there. Reportedly, CCP media often hinted that if US redeployment in East Asia is implemented, China will seek to more visibly corner the US in the Middle East. Is Beijing interested in or capable of doing it? This chapter tries to challenge these conclusions and to offer alternative ones.